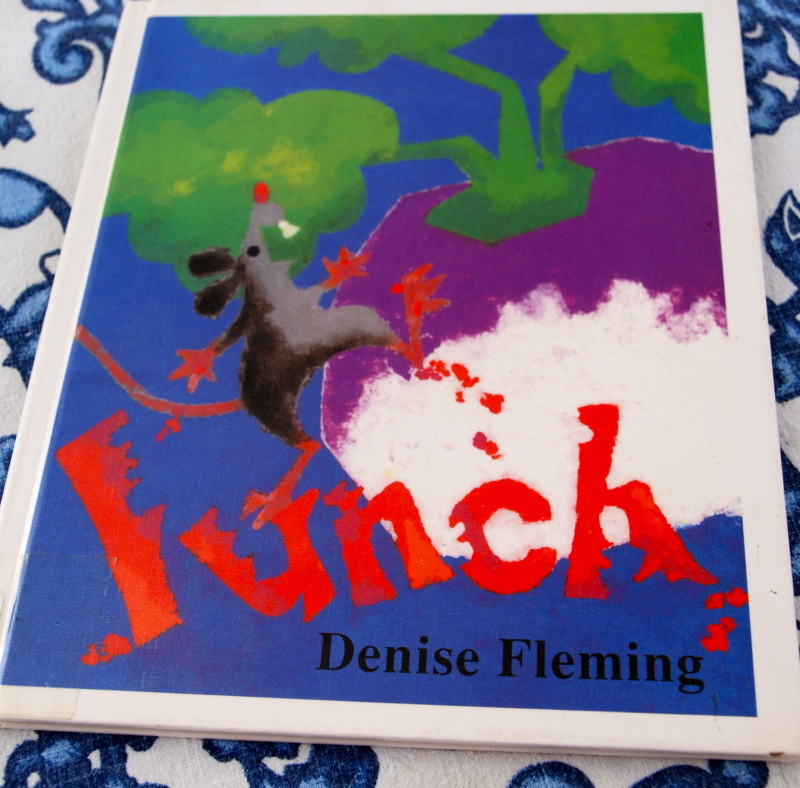 This month the Virtual Book Club for Kids is featuring author/illustrator, Denise Fleming. 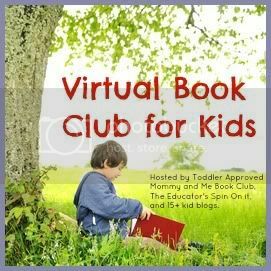 Her books were new to the kids and I … and we had a ton of fun exploring them. One book, however, really fit into another activity we were doing this month. 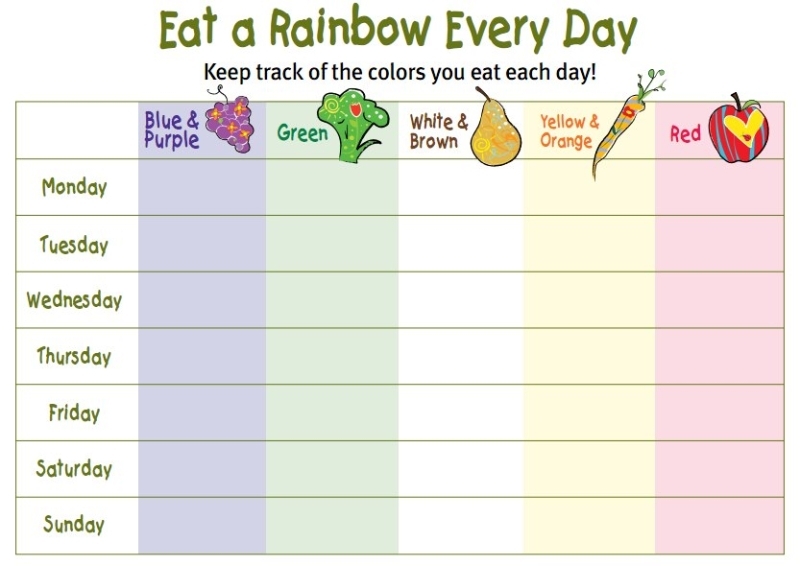 As part of teaching kids about healthy eating, my son’s school has a one week event that challenges the kids to “eat a rainbow” everyday. (And, we’re not talking Skittles!) 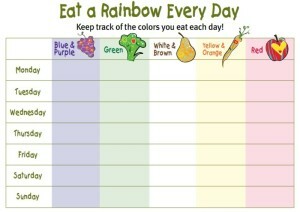 The kids are encouraged to eat a fruit or vegetable from each color category each day for a full week. Color categories included Red, Yellow & Orange, White & Brown, Green, and Blue & Purple. Students that accomplish this goal receive a small reward. So, Denise Fleming’s book, “Lunch” where a cute little mouse eats his way through a bunch of COLORFUL fruits and vegetables was PERFECT to accompany our challenge! Our family has found this to be a great way to talk about healthy eating, trying new foods, and paying greater attention to what we are eating. 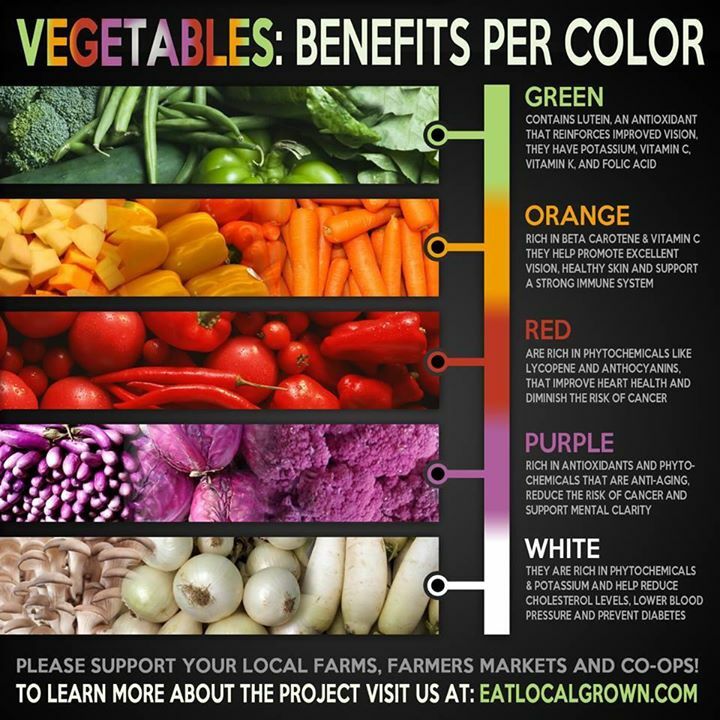 I’ve noticed that when we are focused on “eating a rainbow” we get filled up on healthier food … rather than gravitating toward less healthy options. Make your own pizza … see how many different colored veggies you can add to your own pizza. We found that red, yellow, & green peppers … plus some onion tasted GREAT!. Grab & Go … have fruits and veggies washed and ready to go in a bowl or a special place in the fridge for a quick snack. Apples, bananas, grapes, oranges, pears, carrots, snap peas, celery are perfect options. Ants on a Log … a classic favorite that includes both green (celery) and brown (raisin)! Sip on some soup … many soups are veggie-packed and a excellent way to get all the colors in one bite! Vegetable, Bean, and Minestrone are great choices. Make a Salad … pretty obvious way to eat veggies … and remember fruit salads are great too! Stack ’em up … on sandwiches and burgers. Super Smoothies … making a fruit &/or veggie smoothie can be another yummy way to cover the colors of the rainbow! Kabob it! … There’s something about putting food on a stick that makes it more fun! It’s another fun way to make the food in rainbow order too! 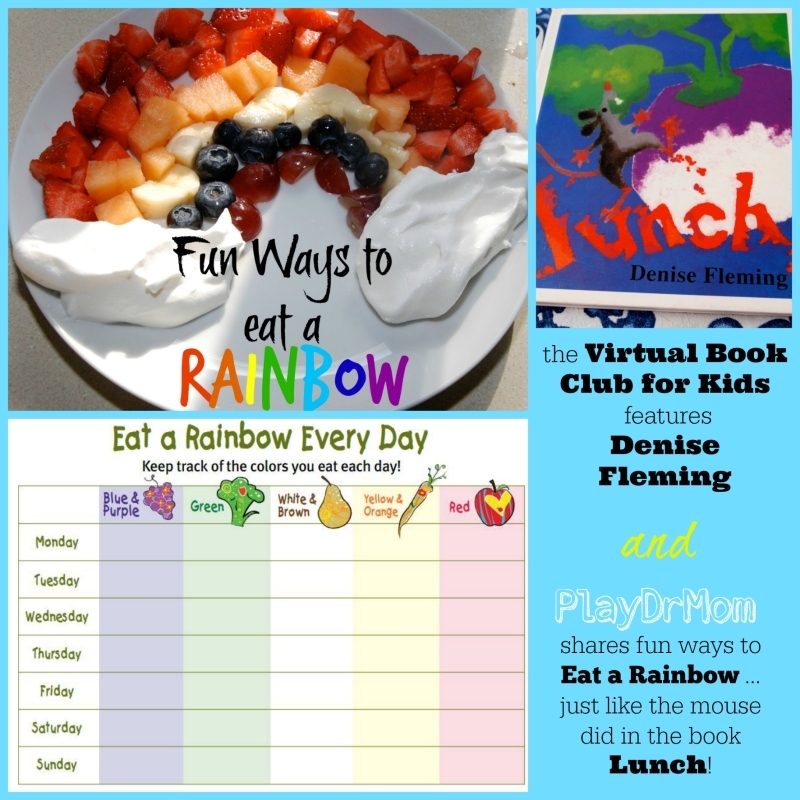 So .. grab a rainbow snack and check out these other terrific ideas to go along with books by Denise Fleming! 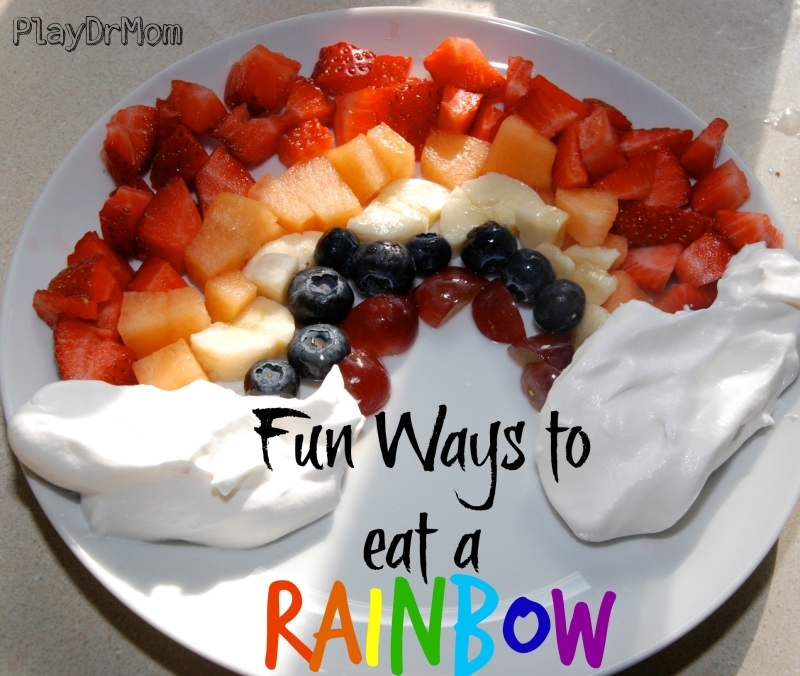 Love all your ideas for eating a rainbow! Thanks so much for sharing this at After School.